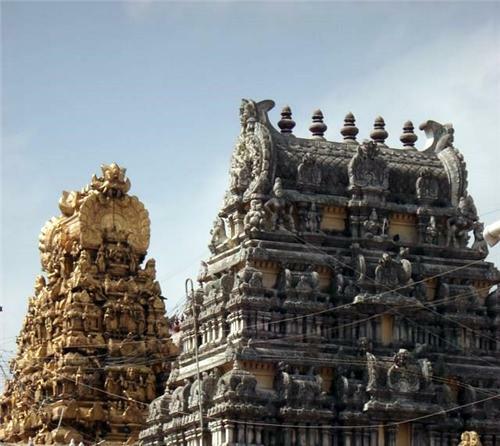 Kanchipuram is called the city of temples owing to its huge number of temples than any other city in India. But a fact exists, strange yet true, that despite of numerous temples in Kanchipuram there is one and only one temple dedicated to Goddess Parvati that is Kamakshi Amman temple. The fact that there is only one temple dedicated to Kamakshi, one of the forms of Goddess Parvati, makes it very important temple to visit for devotees in Kanchipuram. In the word “KAMAKSHI” letter “KA” represents Goddess Saraswati ,”MA” represents Goddess Lakshmi and “AKSHI” refers to the gracious eyes. Goddess Lakshmi and Saraswati are referred as the two eyes of Sri Kamakshi Amman deity. Kamakshi Amman temple was built by the Pallavas during the 6th century and is around 2000- 3000 years old. The original Kamakshi Amman Temple that was built by the Pallavas is presently known as Adi Peeteswari or the Adi Peeta Parameswari, which is near to the presently famous Kamakshi Amman temple. The present Kamakshi Devi temple is known as Bhoga peetam. The famous scholar and saint Adi Shankaracharya founded the Sri Chakra at the original Kamakshi Amman temple. The present Kamakshi temple also has a Sri Chakra established by NrusimhAdvari during the 16th century. After traveling everywhere, when Adi Shankaracharya visited Kanchipuram, he felt the Goddess is in a fierce form. To change her intense form into a sober form and to accomplish her to normal state, the saint sung songs in praise of Goddess and established a Sri Chakra in front of her idol to keep her cool and personified. This Sri Chakram is visible to all of us and all the poojas are done to Sri Chakram also. The Saint established Sri Kanchi Kamakoti Peetam and attained Sarvagyna peetam in this holy city. This Sri Chakra soon became the All India famous Kamakoti Peeta. 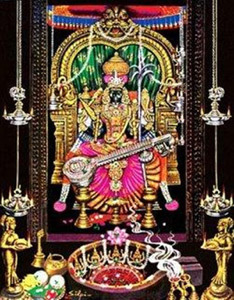 The glory of Kamakshi Devi is mentioned in Devimahatyam in Markandeya Puranam, Lalithopakyanam in Brahmanda Puranam, Sanathkumara Samihitha in Skanda Puranam and Kanchi Puranam. Kamakshi Amman temple is one of the 51 Shakti Peethas in India. Shakti Peethas are the divine temples due presence of Devi Sati’s falling body parts from her corpse. According to a legend, an evil demon named Bandasura became very powerful after getting blessings from Lord Brahma after severe penance. But he took undue advantage of this power by troubling the Devgans. So humiliated were the Devgans that they went to Lord Shiva for help. Lord Shiva asked them to go to Kanchipuram through Bilamarga (tunnel) and pray for BalaTripurasundari Devi. BalaTripurasundari Devi looked pleased by Devgan’s prayers and she emerged in furious form to kill the demon. After killing the demon she started dragging the demon’s body and her angry was not subdued yet. Seeing her ferocious form Devgans got afraid and started to sing song of her praises to pacify her. BalaTripurasundari Devi later became normal. She came to be known as Kamakshi Devi due to her beautiful aura. There is also a legend that once Lord Vishnu turned to blue color due to the poison of Vasuki. Godded Lakshmi Devi made fun of her saying she is fairer than him. Lord Vishnu got angry and cursed her to become ugly. Goddess Lakshmi Devi realized her mistake and went to Kancheepuram to pray for Kamakshi Devi. Kamakshi Devi was pleased with Goddess Lakshmi’s prayer and asked her to stay on her left side. Kanchi Kamakshi Amman kovil is built on five acres and has four entrances. The main entrance has Kalabhairavar deity (a form of Lord Shiva) to its left and Mahishasura Mardhini (a form of Goddess Parvati) to its right. In the center, there is a huge Dwajasthampa (pillar), moving further there is a deity of Vinayagar. On further moving straight, one can see Goddess Kamakshi seated in Padmasana (seated in the form of lotus), a yogic posture signifying peace and prosperity. The Goddess has four arms holding a Sugarcane bow on her left upper arm, lotus and parrot in her right upper arm. The Goddess also has divine chakras called Pasa (lasso) and Angusa (goad) in her arms. The deity also has a Chandrapirai (moon) on her forehead. The place where Goddess resides is “Gayatri Mandapam”. Goddess Kamakshi is surrounded by deities like Saraswati, Annapoorani, Ayyappan, and Adisankaracharya on its outer prakaram. The Goddess also has Varahi, Arupalakshmi Kalvarperumal (one of the 108 Divya Desam of Vaishanavities), Arthanariswarar and Roopalakshmi deities surrounding the sanctorum of Goddess on its Gayatri Mandapam. The Goddess lives in temple in 3 forms – Sri Kamakshi, Sri Bilahasam and Sri Chakram. The temple also has a golden Gopuram on the sanctorum of the Goddess Kamakshi deity which is visible to all devotees. The annual temple festival is called as the Brahmotsavam which takes place in the month of February. During this time the chariot festival (Ther) and lake festival, (Theppam) are held. Other festivals are Navaratri, Aadi and Aippasi Pooram, Sankara Jayanthi and Vasanta Utsavam. Apart from these all the Fridays are considered auspicious in which the Goddess Kamakshi is taken out on a procession within the temple premises on a silver chariot.